ComfortableConservatories. New features that were introduced in version 3, for the window door & conservatory industry. ComfortableConservatories v3 brought in many useful, powerful and time-saving features. Below you can learn of the key options introduced in version v3. This powerful, money and time saving 'CAD' feature allows you to import conservatory 'line' views in to a scalable area, so that you can then draw the customers property next to it, to scale! 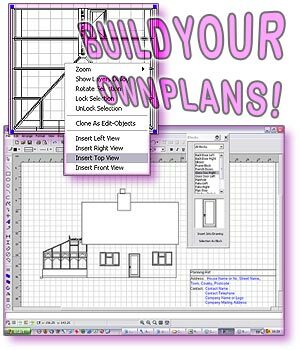 Ideal for drawing plans for planning permission. Add views of the conservatory (left, right, front and plan). Use extensive drawing tools to create houses and more. Change the 'CAD' world size and page size. Save drawings/objects for future use. Print plans to many page sizes (depending on printer). Drawings designed within Comfy CAD can be emailed and more! ComfyCAD really is a complete CAD drawing package in itself! And you get this built-in!. This option was a direct result of customer requests! 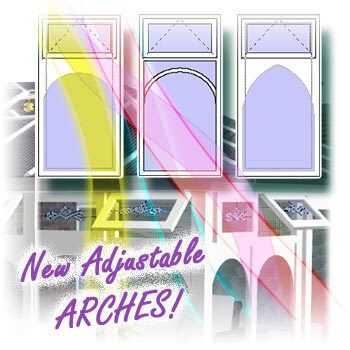 Many of you wanted a future version of the software to have better looking arches that could be adjusted to suit your customers taste. So here it is! Arches automatically inherit the profile colour and are viewable on printed reports. Transfer quotes and orders from one PC to another! Transfer jobs from computer to computer. This exiting new feature allows the user to copy quotes and orders from one Windows® based PC or laptop to another. Files can be stored to blank CD's, portable media drives, saved across networks and more! * You must have a working internet connection and a default email application set up on your system for the email feature. A broadband connection and a large mailbox are also recommended due to possibly large order files (depending on conservatory). Job transfers must always be between the same version of the software. E.g. For ComfortableConservatories v3, the same software version must also be installed on each computer involved and have matching data. This version of ComfortableConservatories introduced the ability to set up defaults for conservatories. This greatly speeds up the design of common conservatories, for when you reach the overlay stage your conservatory will inherit your favoured settings. Massive speed improvement with new panel options! Robust new panel features have been added which really speed up conservatory creation when used! Copy to All - Allows you to replace every single panel in a conservatory with the selected panel (and its effects). Copy to Similar - Allows you to replace all panels 'of the same type' in a conservatory with the same effects as the panel you selected. 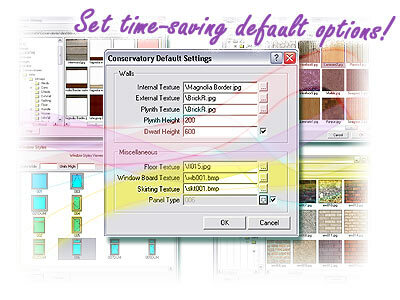 Copy to Empty - Allows you to fill every empty panel slot in a conservatory with the selected panel (and its effects). Paste to Similar - Allows you to replace all panels of the type selected after a panel you selected the copy option on. 28 new 3 Bay Victorian 'equal-hip' &28 new 5 Bay Victorian 'equal-hip' conservatory designs have been added to the system, bringing the total to 280 Conservatory styles! Sensational new reports, offering more detail, more choice and improved line drawings! The software now contains 73 powerful high impact reports. Ability to choose the new improved line quality feature. 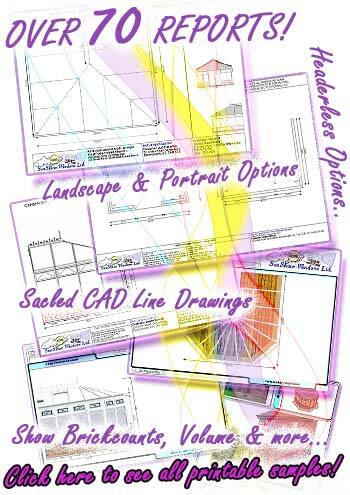 Line drawings can now also be printed as usual or by ticking the new 'Use CAD Line Drawings' feature. Using the new method will produce clearer lines at any scale! NOTE: A 'Report Visibility' feature was introduced in ComfortableConservatories v3, which allowed you to turn reports on and off, so that you can just leave the reports that you prefer to use showing. This has now been superseded in ComfortableConservatories v4 with new enhanced reporting functionality. Over 100 extra RegaLead decorative glass designs added. The glass/lead designs on the system have now been expanded with over 100 more RegaLead® designs! Each design has been adjusted to show transparency, giving a real life-like look! Display lead flashing, flat ceilings and more slates on tiled roofs! Lead Flashing can be displayed. You can choose from the supplied images or even add your own! Flat Ceilings can be displayed in conservatories with solid roof's. You can even choose an image of your own to map to it!. 30 extra tile/slates have been included. If you provide solid (tiled) roofs you now have more to choose from! Remember, you can still add your own if required! Extra enhancements also include; Brick count, PVCu wedges, DXF export, Skip, Quote / Order copy & more! Brick count - You can configure your brick types for inner and outer skins and the software will create an approximate brick count form the floor level up. This can be viewed on-screen and on many base plans. PVCu wedges - You can now display PVC in the rake of square ended lean-to's and lean-to parts of p-shapes etc. When selected this option will inherit the profile colour. DXF export - The conservatory model can be exported as a DXF file for use with other CAD applications that support DXF files. Skip section - This extremely clever feature provides the biggest speed improvement of all! Using the skip button on any screen that it is shown will cause the software to jump straight to the overlay screens. A conservatory really can be created in seconds by using this feature and the new Conservatory Defaults feature together. Copy quote to order - This new function lets you copy or more quotes to the order list. The original quote is then still retained for future use. Once again, many changes under the bonnet to optimise the system are also included in this release. To find out the new features introduced in ComfortableConservatories version 2, please click the next button.